When you call a person thick, it means that he or she (okay, he) has a hard time absorbing information through the dense brain tissue known as gray matter. Even among the rapidly increasing population of Neanderthals them’s fighting words. Among soups? Not so much. More than any other food, people define a soup by how it feels in their mouths. From the chunkiest purees to the thinnest broths and everything in between, soups are categorized by their consistency. On the thin end of the spectrum are the bouillons, stocks and consommés (sometimes). On the thick end are the chowders, bisques, and potages. For me Pea Soup is a no-brainer, which is precisely why I chose it for this week’s soup. My brain needed a rest. I’d had a busy week and needed to put the blog together in a day. So I called on this old stand-by to get me out of a jam. Make no mistake, the soup is terrific, but what it also is, is not mine, at least not all mine. The Split Pea with Cheese Soup from Bernard Clayton’s Complete Book of Soups and Stews is my favorite pea soup recipe. However, since I’ve lost the book, I’ve had to recreate it from memory. The result? A few missteps. My love of whole numbers led me to use one pound of potatoes in this effort. As such, I got the consistency a little mixed up and produced something of a paradox—a pea soup that’s actually thicker than pea soup. My father-in-law, no fan of pea soup, claimed it was very good. My Midwestern spouse thought it too thick and that it needed more ham. To my taste, since most of the flavor comes from the onions, peas and cheese, the ham is irrelevant. I only added it to please my wife. Clayton’s version is actually vegetarian. If you’d like to go veg, leave the ham out. Better yet, try it both ways. On the thickness front, I’ve reduced the recommended dosage of potatoes to ½ pound to thin out the consistency. But if you like it thick, by all means, go for the whole pound. Either way you can benefit from my mistake. Mistakes are the one thing I’ve tried not to be shy about. If you’re like me, you always learn from them, even if you have to make them a few times for the learning to sink in. The fact is, mistakes or accidents are the reason a lot of prepared foods came into being. It would be nice if we could be sure our future mistakes didn’t send us scurrying back to the caves. But our only hope for improvement depends on our willingness to keep experimenting and taking risks. Otherwise, we might go the way of the original Neanderthals. And how might that turn out? Well for one thing, this blog posting would be a lot simpler. Three words: Pea Soup good. * Okay, it’s not the only soup known as a porridge. But “Pease porridge” of hot, cold and nine-day-old fame, is certainly the most famous porridge soup. Add stock, peas, potatoes, ham and seasoning, bring to a boil, then reduce to a simmer for 30-45 minutes. Set aside to cool (10-15 minutes). Puree the soup using an immersion or bar blender. Stir in parmesan, breaking up any clumps to ensure the cheese dissolves completely, and heat the soup through. Stir occasionally to break up the skin that often forms at the surface of this kind of soup. Serve with crusty bread and salad or a nice grilled sausage (I used bratwurst). 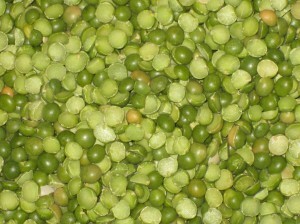 Image Credit: Photo of Dried Peas, split but not pureed by the author. The pea is botanically a fruit, but technically a legume and treated as a vegetable. I know how it feels. Thank you for wading through this week’s thick entry (entrée?). Thanks even more for commenting or letting me know how the soup worked out for you. If you have time, that is. I’ll be reading and responding. Wow, I thought I was the only Neanderthal left. I mean. Good, yes, goooood! Thanks for reading and for the comment. I’m sorry to be so old fashioned, but it’s “Whom” i.e. “You are calling whom thick?” Pet peeve of mine. I find it in the NYTimes all the time. Ya, ya, I know. I’m old. I’m cranky. Keep up the good work. One of these days I’m going to make one of your recipes. But for the moment, I’m enjoying reading them. Thanks for the heads up. Clearly, you are calling me thick. And I completely deserve it. The only thing more onerous is when someone uses whom when they’re not supposed to because it sounds more proper to them. I remember Johnny Carson doing this a couple of times. Usually with a guest who was a little more highbrow than the usual. I’m glad you like the blog. I enjoy writing it. Now I’m going to crack open the copy of Strunk & White that has been sitting on my nightstand for the last few years. Clearly the time is now. Oh yeah! Now were talking THICK. I was amazed at the difference the parmesan made on the final taste and finish. Very smooth. I thought you’d go for the thicker version and if you’ve got any left over, you can always mortar a few bricks together. I’m glad you liked the parmesan too. It’s a great soup. It’s also not your mother’s pea soup, or my grandmother’s for that matter. As I was reading your blog, I suddenly remembered that you were the one that put me on to the recipe in the first place – years ago when I was looking for a new pea soup to try out. So thanks a second time! Sometimes it’s better not to have to invent a soup. Especially when the original recipe is so good. I guess I’m calling you one. Welcome to the tribe. The nice thing is that we still have dating privileges with homo sapiens. It’s a win-win situation. Except for the whole extinction thing.